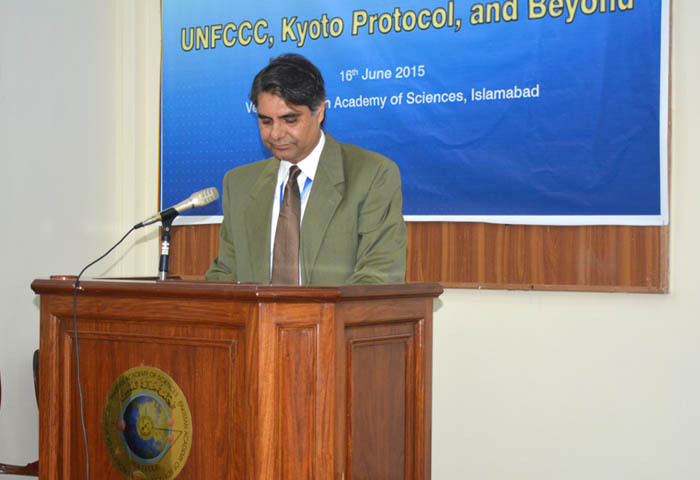 A talk on ‘UNFCCC, Kyoto Protocol, and Beyond’ under COMSATS’ Science Diplomacy programme was organized at Pakistan Academy of Sciences (PAS), Islamabad, on June 16, 2015. Launched in February this year, COMSATS Science Diplomacy programme, inter alia, entails activities on ‘Science Communication’ to create awareness about scientific underpinning of public policies and developmental agenda. The talk held in this connection was delivered by COMSATS’ Science Ambassador on Climate Change, Dr. Athar Hussain. Over 90 participants, representing relevant government departments including the Ministry of Science and Technology, Government of Pakistan; Climate change and environment science professionals; academicians, scholars; as well as members of non-government organizations and think-tanks working in Islamabad attended the talk. Dr. Hussain is currently associated with the Department of Meteorology, COMSATS Institute of Information Technology (CIIT), Islamabad, as Professor of Meteorology. His expertise in climate science includes the application of statistical and dynamical techniques to diagnose climate change signatures. In his Talk, Dr. Hussain presented data regarding Green House Gas (GHG) Emissions and Global Warming (GW) ; the phenomenon of Hiatus in Global Warming, and requirements of Climate Stabilization. Dr. Hussain also highlighted the measures that the nations listed in the Annex-1 of the Protocol are expected to take in order to cut back on GHG emissions. The carbon dioxide reduction mechanisms stipulated in the Kyoto Protocol and related developmental challenges were also highlighted. It was noted that Pakistan accounts for less than 1% of the total global CO2 emissions volume, which is extremely low. However, in solidarity with the global efforts for addressing the needs of the Climate Change phenomenon, Pakistan should make efforts to get propriety rights for Green technology; establish Green industries; and develop and maintain more comprehensive national GHG inventory. He advocated constant dialogue among various national stakeholders to come up with more comprehensive carbon reduction plans for short to long term. 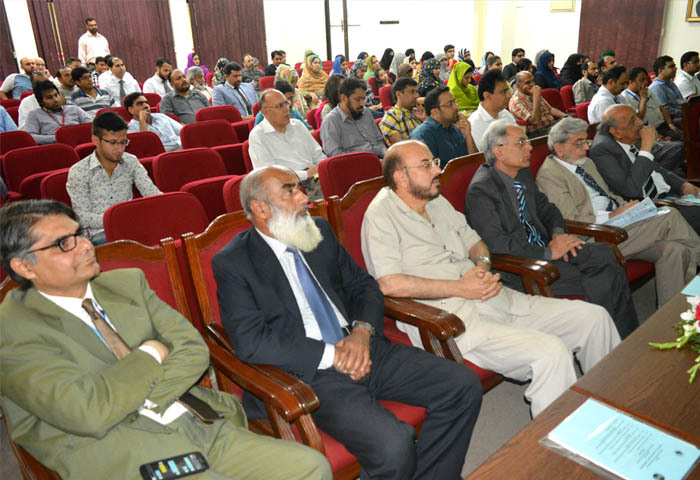 The Talk was followed by an interactive questions and answers session moderated by Dr. Anwar Nasim, President of PAS, during which the interested participants from various institutions made comments and inquiries relevant to the theme of the lecture. 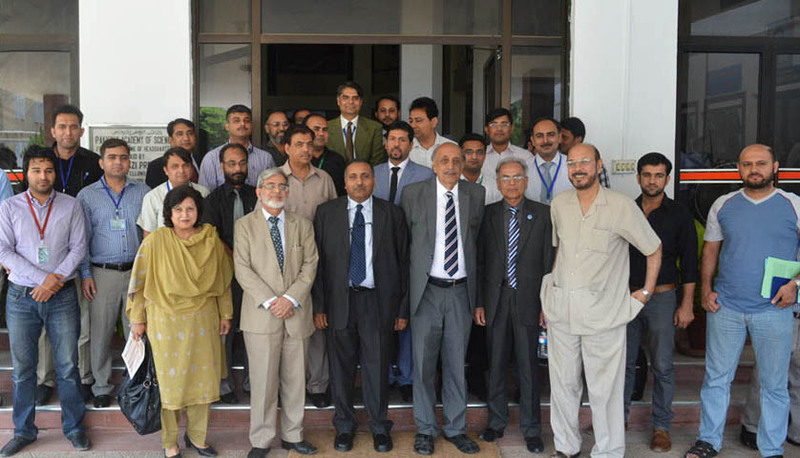 Earlier, Dr. Arshad Saleem Bhatti, Coordinator Science Diplomacy Programm e, made a brief introduction of COMSATS’ Science Diplomacy Programme and opined that this activity can have profound effects at international level. He quoted the examples of Pugwash Conferences on Science and World Affairs, and CERN Laboratories as successful manifestations of Science Diplomacy. He stated that COMSATS has been a practitioner of Science Diplomacy without specifically categorizing it with this diction. He noted that the activities of the programme will be aligned with important prevalent issues that call for strong scientific diplomatic coordination at regional and global levels, such as Climate Change, Health, Sustainable Development and Cyber-security. 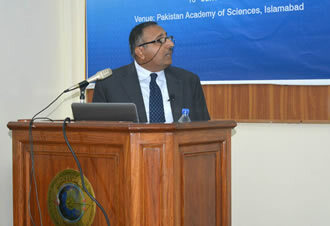 Speaking on the occasion, Dr. Qureshi acknowledged the support of senior officials of PAS, and ECO Science Foundation. In view of the geo-political developments, developmental disparities and economic limitations of the developing countries, Dr. Qureshi asserted the need for more pragmatic and evidence-based decision-making regarding commitments made towards international climate change policies, consortia, and agreements. He also highlighted the major forms in which Diplomacy and Science co-exist, in view of the related jargon that has started being coined since 2012. Dr. Qureshi also informed the audience that COMSATS has started the necessary capacity-building of its designated officials with cooperation from The World Academy of Sciences (TWAS). He also informed the audience about the participation of a COMSATS’ official in the 2015 AAAS-TWAS Summer Course on Science & Diplomacy, recently held in Trieste, Italy. Dr. Qureshi presented Dr. Athar Hussain with a plaque to honor his intellectual efforts. The technical session was followed by the signing of a Memorandum of Understanding (MoU) to formalize the cooperation between TWAS and COMSATS in the field of Science Diplomacy. The said cooperation has already been initiated since the launching of COMSATS Programme in February 2015. The Executive Director COMSATS, Dr. I.E. 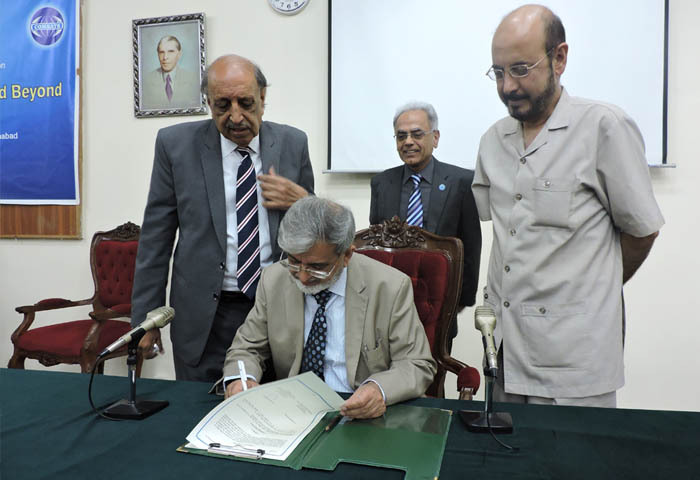 Qureshi, signed the MoU on behalf of COMSATS. Dr. Qureshi noted that the signing of the Memorandum could not be signed concurrently by the Executive Directors of both COMSATS and TWAS due to the latter’s prior engagements. The areas of collaboration defined in the MoU include joint organization of lectures, workshops, conferences and seminars in Member States of COMSATS to create awareness about scientific background and solutions of issues affecting public policy and foreign relations. The two organizations would also exchange relevant intellectual resources, information, and data to help serve the purpose of the agreement. 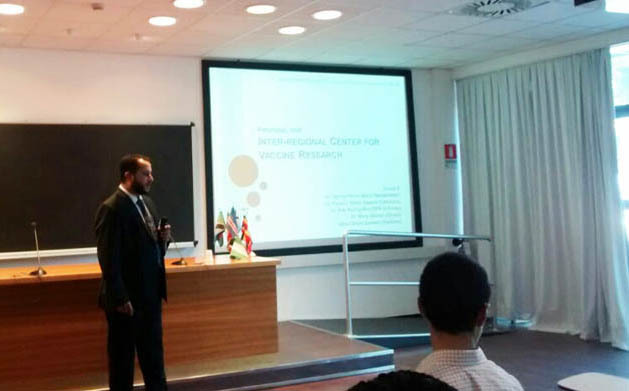 In order to strengthen the organization’s capacity to effectively execute its Science Diplomacy programme, one of COMSATS’ officials, Mr. Abdul Majid Qureshi, Research Scholar, attended the 2015 AAAS-TWAS Summer Course on Science & Diplomacy, held in Trieste, Italy, from June 7-12, 2015. As part of the ongoing collaboration between the two organizations, The World Academy of Sciences (TWAS) hosted the participation of the said official of COMSATS. Around 51 participants and speakers from around the world had gathered to discuss and exchange ideas relevant to the relatively new and emerging theme of “Science & Diplomacy”. The seven interactive traini ng sessions covered important sub-themes of the concept: Introduction to Science Diplomacy; Trans-boundary Science, National Circumstances and Approaches to Science Diplomacy; Networks and Mechanisms for Science Diplomacy; Science Advice/Communicating Risk to Policy Makers; and Risk Communication to the Public. An overview of TWAS’ programmes and opportunities relating to science diplomacy was also presented. A highlight of the event was a Lecture by Sir Peter Gluckman, Chief Science Adviser to the Prime Minister of New Zealand. The Workshop also comprised of group projects whereby multi-national groups of individuals from diverse national, and scientific backgrounds were required to reach consensus over a problem statement of transnational nature by applying the skills gained during the technical sessions of the Workshop. The group projects were supervised by experienced mentors, and were later presented and defended on the last day of the Workshop. Mr. Abdul Majid Qureshi represented Pakistan in a group comprising of participants from Bangladesh, Colombia, Korea (DPR), and Ghana. 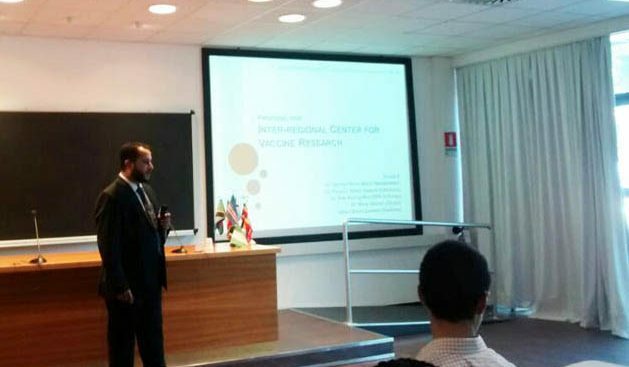 The project concerning establishment of an inter-regional vaccine research centre that Mr. Qureshi presented on the close of the workshop had been supervised by CEO/President of CRDF, Dr. Cathy Campbell and Foreign Secretary of the Cuban Academy of Science, Dr. Sergio Jorge Pastrana. The Workshop concluded on the note that participants will use the networking developed with the alumni of the AAAS-TWAS Courses in 2014/15 in order to conduct similar exercises in their respective countries and share their outcomes with TWAS during the next year.